Imagine if you could only find clothes on sale twice a year. What would be the result? Semi-annual Black Friday-like shopping melees? Caddy women (and a few men) jockeying for prized items? An upsurge in foreign tourists hoping to pounce on deals of up to 90% off on luxury goods? An intermittent upsurge in personal debt? Try all of the above. Les Soldes is France’s twice a year state-sanctioned event where sellers are allowed to drop the price on clothes and other goods below cost and when, as observed in this article, it’s not uncommon to see women during the week before, slyly eyeing their upsuspecting prey for the day when they can attack with a vengeance and snap up their long-sought-after prizes for basement prices. 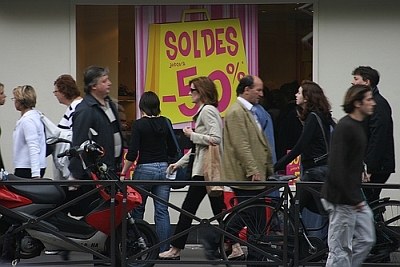 If you’re planning on heading to Paris and taking part, the next Les Soldes takes place from January 9th to the 20th, just in time to get your mind off of your credit card bill from Christmas!